The stately 100 Coronas gold coin pieces are a must for any serious coins collector. The original Coronas were struck in 1908 to celebrate the 60th anniversary of the reign of Emperor Franz Joseph I of the Austro-Hungarian Empire. They therefore represent historical importance and together with almost a full ounce of gold are an excellent investment for coin collectors. Why buy 100 Coronas Gold Coins? 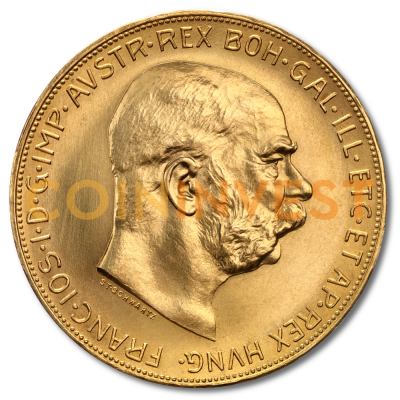 The 100 Austrian Coronas gold coin has distinct advantages over other coins on the bullion market that makes them such a popular choice by collectors in the know. Their weight and purity are guaranteed by the Austrian sovereign government and given they contain 1.08 troy ounces fetch a tidy sum in the bullion market. They also reach a worldwide audience so typically carry a low premium and are easy to buy and sell. Modern restrikes are made to the highest industry standards, but the commemorative coins still bear the date 1915 which was used as a way of getting round the US prohibition of gold ownership prior to 1975. The Austrian Mint first began minting the gold coronas in 1892, when Franz Joseph I ordered a currency reform. The first coins carried values of 10 corona and 20 coronas. The larger 100 corona followed in 1908 to commemorate the diamond jubilee of the Emperor. The Austrian Mint ceased production of gold bullion coins following the outbreak of World War I, and when minting began again in 1921, the decision was made to date the coins 1915 to mark the last full year of the King’s reign. Franz Joseph I died in 1916, and to commemorate his 68 year reign, all restrikes of the 100 Corona piece after that date are still inscribed with the year 1915. For more than fifty years, the 100 Austrian Coronas was one of the widely distributed gold coin on the bullion market, but was muscled out by the South African Krugerrand which was made specifically to target a consumer market of private collectors. When US laws changed to allow private investment in gold coins, the Austrian Mint increased production levels of the 100 Corona to challenge the Krugerrand together with the Mexican 50 peso which was also proving to be popular in the mid 1970’s. The Austrian Mint is over 800 years old and has had great success combining tradition with modern developments of coin manufacturing. The 100 Corona Gold Coin is undoubtedly one of the Mint’s finest products which is why it is so popular the world over. Manufactured to the highest standards, the 100 Corona, the weight and purity is backed by the Austrian government and offers exceptional financial security for owner. To buy the 100 Austrian Coronas from the CoinInvest online store, all you have to do is update the quantity field to the right of the image and add your order to your shopping cart. From there, let us know the country you would like your order shipping to then input your card details or select bank transfer as a payment method and proceed to check-out. CoinInvest also buy 100 Corona gold coins so if you have any at your disposal, please do not hesitate to contact a member of our staff who will be happy to take the details and confirm an offer via email. As a leading dealer of gold bullion coins, we offer highly competitive prices at latest spot prices. Also I think the product detail stating "given they contain 1.08 troy ounces" is incorrect. The coin has 30.49 pure gold, so the correct statement would be .9802 troy ounces.